The Keto Reboot is here and it’s amazing! Have you ever done a cleanse? The Reboot is similar, in that it is a liquid fast for 60 hours (2 full days and the night before and the night after). The goal of the Keto Reboot is to reprogram your body to burn fat as fuel and preserve muscle at the same time. It is better than a typical cleanse in that it reboots your system into its’ native state to create lasting ketogenic benefits. You do not have to be following a Ketogenic diet in order to reboot your system. The Keto Reboot starts the second Sunday of every month, so everyone can do it together! It’s actually a lot of fun having all that support and motivation. 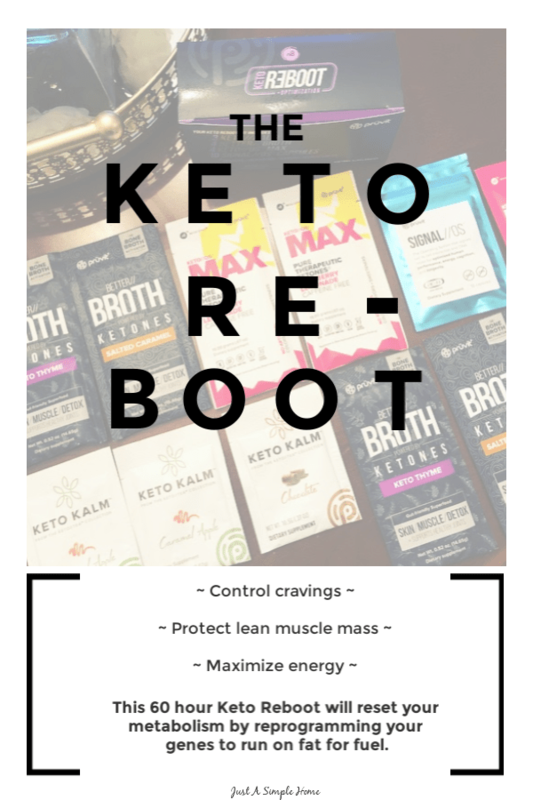 The Keto Reboot is typically only available for purchase the week before the Reboot is scheduled to start. Make sure to order your Reboot by the last day of the sale so you can start in time. Of course, you are welcome to start whenever you like, but having a group to do it alongside you makes it so much easier! Do You Get Results in Only 60 Hours? Absolutely! Of course, I can’t guarantee it. But check out a few of my friends right here. Yes, this was only after 60 hours! Day 1 starts on Sunday. You eat normally during the day and have your have Keto//OS that night along with your first Keto//KALM and water. Days 2 and 3 (Monday and Tuesday), you follow this schedule below. Your kit contains everything you need for the entire duration. The entire system is very easy to follow and the support within the group is incredible! Once you get your kit be sure to join my Free Support Group and then you will get the link to join the big Reboot group! After you finish your Reboot, the support doesn’t stop. You will still be in our free community, with continued support on your keto journey. We also help you introduce foods back into your diet, in a way that keeps your success going! Contact me for a $10 OFF COUPON! ** Disclaimer:** Results represented in these images are specific to this individual and may not be representative of your results based upon your diet, exercise, lifestyle and health factors. This is something that I totally need to get on-board with doing. I always considered myself a clean eater. Then Halloween came up last year and I got into junk food mode. I need to do a reset and get back into eating clean. I feel so much better when I avoid the junk. I really would like to give the bone broth a whirl! So interesting! My daughter and I do a lot of Keto recipes, but I have not tried these products. I am embarrassed to admit I have samples a friend gave me, Several months ago. I guess I will need to try them! Thanks so much for the info! The Keto diet helped my sister in law lose 40 lbs! It really works 🙂 I haven’t done it, but that looks like a simple way to reboot a diet. I heard the Keto diet can feel like you have the flu at first. This is amazing! I can’t believe people are seeing results so quickly – definitely makes me want to give Keto a try!